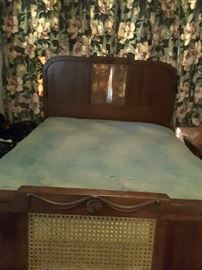 AddressThe address for this sale in San Jose, CA 95110 will be available after 9:00am on Thursday, April 25th, 2019. 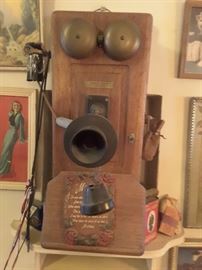 WELCOME TO OUR WONDERFUL TIME WARP ESTATE SALE - EVERYTHING VINTAGE!!!!!!! 10 PEOPLE ONLY WILL BE ALLOWED INSIDE THIS 1004 SQ FT HOUSE AT A TIME. EACH SHOPPER WILL BE ALLOWED 20 MINUTES TO SHOP DUE TO THE QUANTITY OF ITEMS AND TIGHT SPACE. ONCE A SHOPPER LEAVES, YOU WILL NEED TO GO BACK AND STAND IN LINE TO SHOP AGAIN. WE EXPECT LINES AND PEOPLE AT THIS SALE DUE TO THE UNIQUE VINTAGE ITEMS AND LARGE QUANTITY. THE HOUSE IS VERY TINY SO THERE IS LITTLE SPACE TO MOVE ABOUT OR TURN AROUND. PLEASE RESPECT EVERY SHOPPER'S CHANCE TO SHOP AND LOOK AND BUY ITEMS, SO PICK YOUR ITEMS WISELY AND ALLOW OTHERS IN TO SHOP AS WELL. We gladly accept Cash and all Major Credit Cards. Sales Tax On All Sales for Zip Code 95110 is 9.25% calculated on Cash and Credit Card Sales. We no longer take checks. All SALES FINAL, No Refunds. 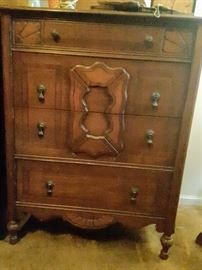 We hope to see you at our Estate Sale over the weekend or at a future Estate Sale. We do not offer Pre-Sale pricing or pricing over the phone. Please note all sales terms and conditions displayed. NOTE: Please bring your Truck/Van, Dolly, and your Helpers!! You will need your own Help to move items. This Estate Sale shall take place inside the House, Garage. Entrance will be at the Garage Door Area, going around the backyard and entering into kitchen to the main house area and small back 2 bedrooms. Exit will be out the Front Door. Please also note, the front 3 steps up to the front door with railing on either side. Due to the fact of these steps going into the house, the line up for the Estate Sale will be at the Garage Door Area. Please WATCH YOUR STEP in all areas, especially in the entrance to the laundry area with steps and going into the main house. Upon exiting the house there are 3-4 steps with 2 railing on either side, PLEASE WATCH YOUR STEPS! Watch all marked areas with yellow and blue tape and and orange cones. The garage is tight for handicapped chairs. A cane is permitted. Please Watch your Steps. Watch Your Steps Signage posted. Due to the tight nature of the house and small space of 1004 sqft.,, walkers and wheelchairs are unable to be accommodated. ANNOUNCEMENT: There will be a cashier/pay station in the house only. Please pay for All Your Items inside the House. FIRST COME FIRST SERVE: First Come - First Serve. We do not keep any lists. 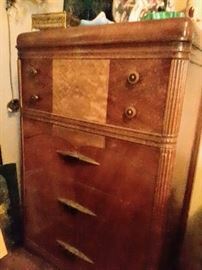 Please no grabbing, hoarding or rushing into the house or house areas and please be respectful of each shopper visiting this Unique Estate Sale. PLEASE "THINK GREEN" and plan to bring your own recycle bag(s), to carry your purchased items home. We will have some paper bags offering as well. ORANGE CONES MARKING - Please No Parking in driveway only if you are loading large items, such as Furniture, Appliances. "Loading Zone" Signage noted in the driveway. Thank you very much in advance for following these instructions. PARKING INSTRUCTIONS: Please be respectful of the neighbors, please do not park in the driveways of the neighbors, please do not block or park in the driveways of the Estate Sale house or block the mail boxes for mail deliveries and for garbage pick ups for neighbors. Teenagers aged 13 and over permitted. Please no pets (service animals allowed). Moving Company: If you require A Moving Company for the furniture, we can provide you the name of a Moving Company for you. Moving Green Today will not be "moving or lifting furniture". Follow Bright Green Arrows and Estate Sale Signs For MovingGreenToday. Team Members will be wearing MovingGreenToday Green Shirts and Name Tags offering friendly, efficient, and professional customer service in every way possible. Have a wonderful time at our Estate Sale!! 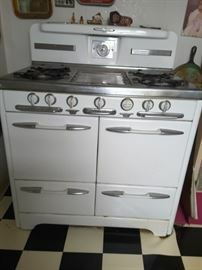 O'Keefe and Merritt Gas Stove. Please Bring own movers, dolly,and tools to remove. Heavy. 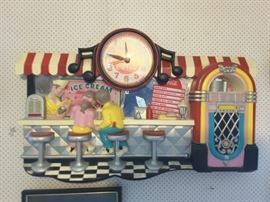 Vintage Wall Clocks with Bells. 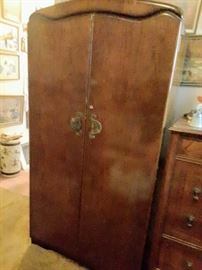 Vintage Tall Armoire for Clothing. 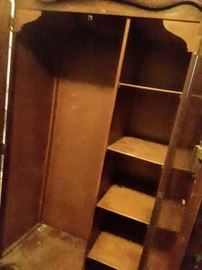 Inside of Tall Vintage Armoire. Brass Fireplace Cover with Bird Design. Postcards, collectible mixed buttons and political buttons, Marilyn Monroe.nsmall inlaid round table. Carnival music box. Quick books. Round table. Cowboy clock, beautiful women ceramics. Sailors hat with political buttons. 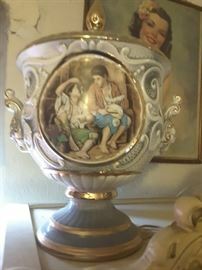 Carnival glass, vase, pictures. Chalkware figures and carnival glass. Chalkware figures and carnival glassware. 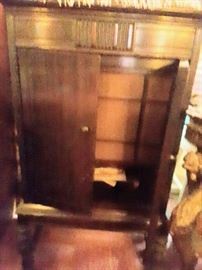 Tall hutch with 3 glass shelves and lower cabinet with 2 sides, 1 middle section that has 3 drawers. Collectible cigar boxes, spice containers, ashtray. Small shelf 3 upper, 3 lower shelves. Collectibles. Vintage Coca-Cola trays. High end. Vintage Noritake China 45 pieces from 1990. Gold rimmed. Vases and beautiful women ceramics. 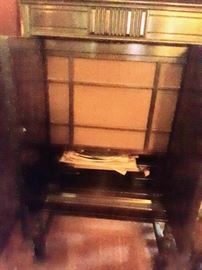 Ornate 3 shelf glass cabinet, collectibles. 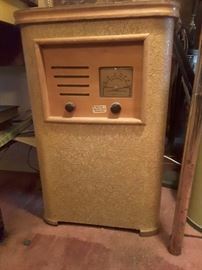 Vintage reproduction radio, collectibles. Pictures.